The Edmonton Oilers are hoping that Nail Yakupov's success in junior hockey will lead to a fast start to his NHL career. The Oilers took Yakupov with the No. 1 pick in the NHL Draft in June, and they hope he'll be ready to step right into a regular role at age 18 -- the same way Ryan Nugent-Hopkins and Taylor Hall did for Edmonton in the past two seasons after being the first players selected in their draft years. Both played well and appear to be on their way to fine careers. The two No. 1 picks before that, Steven Stamkos (2008) and John Tavares (2009), also entered the NHL right away, and both look like they'll go on to long and successful careers. But both had good, not great, seasons as 18-year-olds: Stamkos had 21 goals in his first season, but his 156 goals in the past three seasons are the most in the NHL. Tavares scored 24 goals and had 54 points as an 18-year-old, but is coming off an 81-point season with the New York Islanders in 2011-12 and shows signs that he's capable of a lot more. The Indianapolis Racers will live on in hockey history for one reason -- they signed a skinny 17-year-old from Brantford, Ont., named Wayne Gretzky in the summer of 1978. The NHL wouldn't touch players that young -- but the World Hockey Association, then in its dying season, wasn't as fussy. Gretzky, a star in junior hockey, played just eight games with the Racers before being sold to Edmonton and helping the Oilers make it to the last WHA final (they lost). No NHL team owned Gretzky's rights -- he'd never been drafted because of his age -- so Edmonton was able to keep him when the NHL absorbed four WHA teams in the summer of 1979. Though skeptics were sure Gretzky would be banged around and shut down in the bigger, tougher NHL, the skinny 18-year-old kept right on scoring. By the time he turned 19, midway through the 1979-80 season, he was already terrorizing goaltenders. Gretzky finished his first NHL season with 137 points, tying L.A.'s Marcel Dionne for the scoring lead (Dionne won the Art Ross Trophy by scoring two more goals) and leading the Oilers to the playoffs. 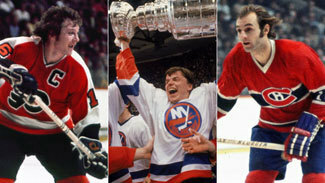 Because he had played one pro season in the WHA, Gretzky was ineligible for the Calder Trophy as the NHL's best rookie. Though it's not listed as the rookie record, Gretzky 137 points are still the most ever by a player who was 18 for any part of a season. Hawerchuk turned pro at age 18 after a fantastic season with Cornwall of the Quebec League, scoring 81 goals and 183 points in 72 games while leading his team to the Memorial Cup and earning Canadian Hockey League Player of the Year honors. It was no surprise when the Winnipeg Jets -- coming off a season in which they won just nine of 80 games -- took Hawerchuk with the first pick in the 1981 NHL Draft and put him right into the lineup. He stepped in and became the first NHL rookie to score 40 goals and finish with 100 points in the same season. Hawerchuk's spectacular rookie season not only earned him the Calder Trophy as the NHL's top rookie, it helped the Jets to a 43-point improvement and a second-place finish in the Smythe Division. Hawerchuk led the Jets in scoring for nine consecutive seasons on his way to the Hall of Fame. Crosby was the most hyped junior player in decades, and the Penguins won a lottery after the work stoppage that gave them the No. 1 pick in the 2005 NHL Draft. There was never any question that he'd be the first player taken. Crosby quickly showed why everyone wanted him, becoming one of only seven players to reach the 100-point mark in his rookie season -- and only the fourth to do so as an 18-year-old (the third in his first season after being drafted). Given the drop in scoring since the 1980s, you can make the argument that Crosby's rookie season was the most impressive by a first-year player of any age in the 40-plus years since expansion. The Penguins had finished last in the overall standings in 2003-04 before landing Crosby and were only marginally better (next-to-last overall) with him in the lineup as a rookie. But two years later, Crosby and the rebuilt Penguins were Stanley Cup finalists; one year after that, they were champions. Though he's had concussion-related problems during the past two seasons, when Crosby is healthy he offers a blend of skills, strength and determination unmatched in the NHL today. The Penguins' reward for finishing last in the 1983-84 season was the chance to draft Lemieux, an immensely talented 18-year-old center from Laval of the Quebec League. He showed his skills immediately, taking the puck away from future Hall of Famer Ray Bourque and scoring on his first shot during the first shift of his NHL career. Despite missing seven games with injuries, Lemieux earned the Calder Trophy as the NHL's top rookie. The Penguins improved by 15 points -- though they were still next-to-last in the League with 53. Lemieux continued to pile up points, though the Penguins needed five years after his arrival to get into the playoffs. He led the Penguins to the Stanley Cup in 1991 and 1992, and won a third Cup as an owner (and Crosby's landlord) in 2009. It might seem incredible now, but Yzerman wasn't the player the Detroit Red Wings had hoped to draft with the fourth choice in 1984. They really wanted Pat LaFontaine, who had played in the Detroit area and (they felt) might help sell tickets for a team that was having trouble at the box office. But when the New York Islanders nabbed LaFontaine with the No. 3 pick, the Wings had to "settle" for Yzerman, a high-scoring center with Peterborough of the OHL. Though Yzerman had the best scoring numbers of any rookie in 1983-84, he finished second in voting for the Calder Trophy to Buffalo goaltender Tom Barrasso, a fellow 18-year-old. Yzerman's presence helped the Wings improve by 12 points and make the playoffs. He became the Wings' captain when he was 21, went on to score as many as 155 points in a season, and later became one of hockey's greatest leaders while sparking the Wings to three Stanley Cups and earning a berth in the Hall of Fame. He's now the general manager of the Tampa Bay Lightning. The Kings were in disarray after finishing 1985-86 next-to-last in the overall standings -- their 54 points left them ahead of only the Red Wings. After the Wings took Joe Murphy with the No. 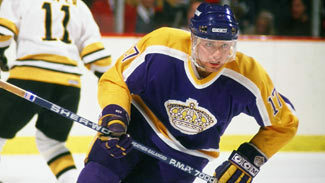 1 pick in the 1986 NHL Draft, the Kings used the second pick to grab Carson, who was a high-scoring center with Verdun of the Quebec League. Carson stepped right into the Kings' lineup at age 18 and began putting up points. He finished second on the team in goals (behind fellow rookie Luc Robitaille, a 20-year-old) and third in scoring, helping the Kings improve by 16 points and make the playoffs. Carson was even more spectacular as a 19-year-old, scoring 55 goals and 107 points. In the summer of 1988, Carson was part of the package the Kings sent to Edmonton for Wayne Gretzky. He scored 49 goals and 100 points in his first season with the Oilers -- but he wasn't Gretzky, and quickly became uncomfortable in Edmonton. Carson, a Michigan native, was traded to Detroit in 1991 but never reached the heights he'd hit in his early years. His numbers don't rival those of Gretzky or Lemieux, but considering that he plays in an era when scoring is difficult, Skinner's achievements speak for themselves. Skinner's selection by Carolina with the seventh pick in the 2010 draft was a stunner -- Central Scouting rated him just 34th among North American skaters despite a 50-goal, 90-point season with Kitchener of the Ontario Hockey League in 2009-10. Even more stunning was that he earned a job with the Canes and looked right at home in the NHL despite being the League's youngest player. Skinner scored his first NHL goal on Oct. 20, became the first 18-year-old since Yzerman to play in the All-Star Game when he was named as an injury replacement for Crosby and finished his first NHL season with 31 goals and 63 points. That was good enough to win the Calder Trophy as the League's top rookie, making Skinner the first player since Barrasso in 1983 to do so while playing all or most of his first season as an 18-year-old. Seven teams passed on Bourque in 1979 before the Boston Bruins chose the Montreal native, who was coming off back-to-back 22-goal seasons on the blue line with Verdun of the Quebec League. Most of the 18-year-olds who were able to make an impact did so largely because they were chosen by weak teams that were desperate for a talent upgrade. Not so with Bourque, who joined a team that had come within two minutes of making the Stanley Cup Final the previous spring. But Bourque showed he was more than ready for a full-time job by putting up 17 goals and leading Boston's defensemen in scoring. The Bruins improved to 105 points from 100, though they finished second in the Adams Division and were upset in the preliminary round of the playoffs. Bourque went on to a Hall of Fame career, finally winning a Stanley Cup with Colorado in 2001 after two decades with the Bruins. He was a star from the day he stepped on the ice to the day he hung up his skates. No defenseman in the expansion era has had a bigger effect on his team in the first season after he was drafted than Murphy did with Los Angeles in 1980-81. The Kings, who historically had struggled defensively, took Murphy with the fourth choice in 1980 and wasted no time putting him into the lineup. They were rewarded with a 16-goal, 76-point season -- still the most assists and points by a first-year defenseman in NHL history -- and a 25-point improvement in the standings. 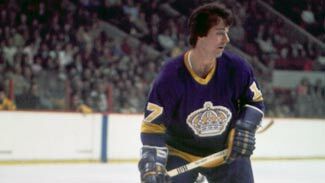 The Kings dealt Murphy to Washington in 1983-84, and he went on to win Stanley Cups with Pittsburgh and Detroit on the way to the Hall of Fame. The Boston Bruins and New York Rangers spent much of the pre-expansion 1960s battling to avoid last place in the six-team NHL. Both teams finally dug themselves out, and the arrival of Orr was a big reason for Boston's improvement. Orr was a sensation almost from the time he began playing hockey at age 4. The Bruins discovered him at a bantam tournament and paid to sponsor his team, then signed him at age 14. He played for Oshawa of the Ontario League at 15, and in his final season led the Generals to the league title with 94 points in 47 games. Orr stepped into the NHL as an 18-year-old and looked right at home, scoring 13 goals and 41 points in 61 games as a rookie playing for a last-place team. That was more than enough to earn him the Calder Trophy as the NHL's top rookie -- and generate one of hockey's most famous quotes. Rangers defenseman Harry Howell, who had a career year and won the Norris Trophy as the NHL's top defenseman, said, "I'm glad I won it now, because it's going to belong to that Orr from now on." It did -- for the next eight years. Orr was the game's greatest player through the first half of the 1970s before knee problems did what opponents never could -- shut him down. He played only 36 games after 1974-75 and hung up his skates for good at age 31. It's hard enough for any rookie to step into the NHL just a few months after being drafted. That goes double for kids coming out of U.S. high schools -- especially goaltenders. Someone forgot to give that message to Barrasso after the Buffalo Sabres took him with the fifth selection in the 1983 NHL Draft. Barrasso had been spectacular at Acton-Boxboro H.S. in Massachusetts, piling up 17 shutouts in 46 games in his last two seasons. He quickly showed those numbers were no fluke by coming to a veteran team, beating out veterans Phil Myre and Jacques Cloutier for the starting job and winning 26 games with a 2.84 goals-against average while helping the Sabres improve from 89 to 103 points. Not only did Barrasso win the Calder Trophy as the NHL's top rookie, he took home the Vezina Trophy as the top goaltender and was named a First-Team All-Star. No teenage goaltender has come close to his accomplishments, and it's hard to see anyone doing it in the near future. Barrasso went on to win two Stanley Cups with Pittsburgh in the early 1990s and retired with 369 victories, now the second-highest total by a U.S.-born goaltender.